When one thinks of USSR stamps, at least from a Western point of view, the first thing that comes to mind are the thousands of pictorial commemorative postage stamps, glorifying the achievements of their Communist state, that were issued throughout most of the 20th Century. 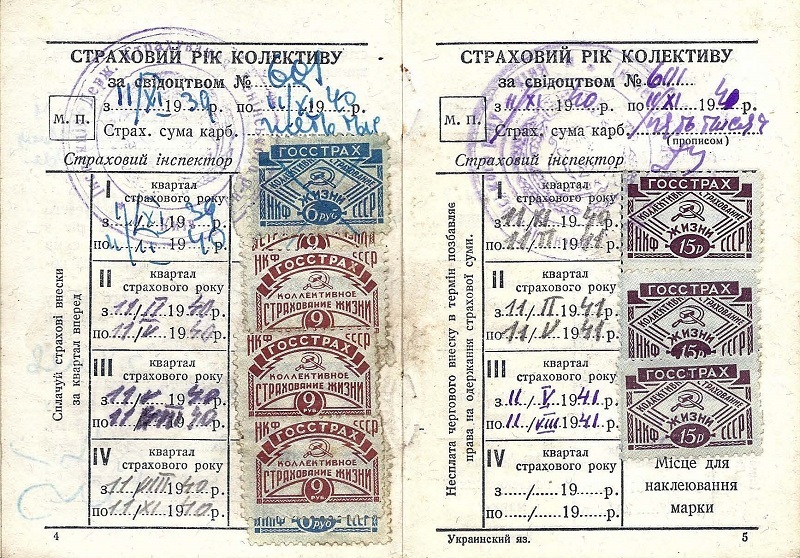 During the Russian Empire, revenue stamps were common, as the empire was a consumer-based, capitalistic society, but I have never heard of the Union of Soviet Socialist Republics issuing any revenue stamps. That is, until I received a CONTACT FORM inquiry from a website visitor recently! 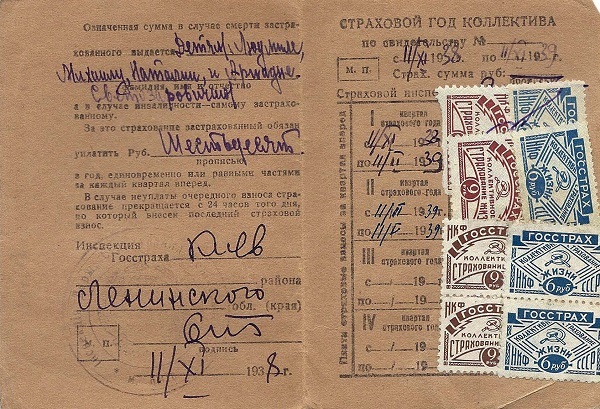 My website visitor indicated that his wife's grandparents had immigrated from the Ukraine to the United States during the 1940's, and that among their papers were some booklets that contained what appeared to be USSR tax or revenue stamps from the period between 1938 and 1941. I asked him to send me scans of them, which resulted in the creation of this new RUSSIA category webpage. 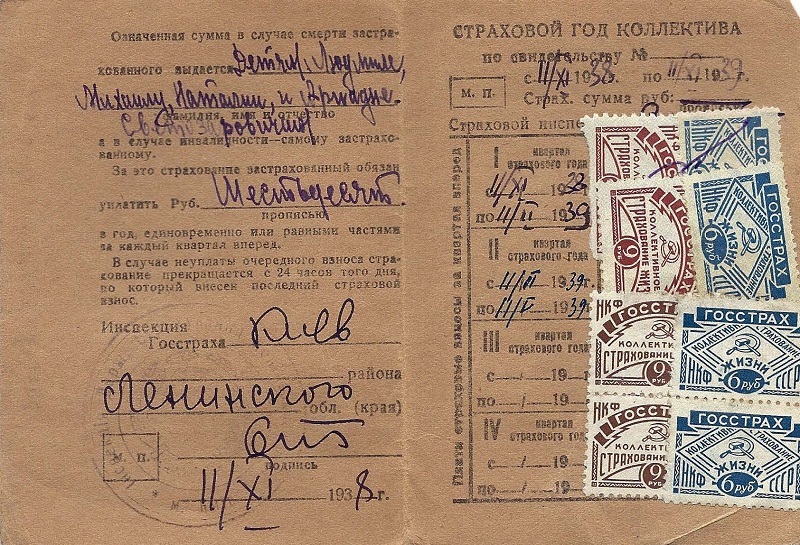 A 6 Ruble denomination USSR State Insurance revenue stamp for Collective (Group) Life Insurance is shown in the image above. with the hammer and sickle in the middle). In this context, the Russian language word for "collective" refers to a "group of workers", such as an office building or a factory, thus, this translates to what is known in the West as "Group Life Insurance". 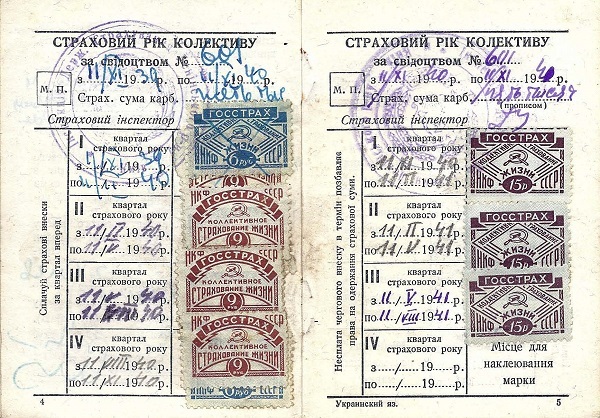 Unfortunately, I do not have any detailed catalog information on these State Insurance Collective (Group) Life Insurance revenue stamps, as they are not listed in my USSR specialized postage stamp catalog. As can be seen in the images shown further below, there are different denominations, designs, and colors. The 6 R., 9 R., and 15 R. denominations are shown in the images. I have also seen a 3 R. denomination elsewhere on the internet. If anyone has any detailed philatelic information on these stamps, such as the dates of issue, types, perforation gauges, denominations etc., they would like to share with this website, I would greatly appreciate it. This type of state collective life insurance not only provided death benefits for workers' families, but it also provided for temporary incapacity from sickness, maternity leave, care of sick relatives, old age pensions, and orphans' pensions. It has been said by philatelists that "stamps are a reflection of history" and that "every stamp tells a story". This is even more true with postage stamps affixed to interesting historical covers, or in this case, with revenue stamps affixed to historical documents. Researching the following documents was not only a journey of discovery for the visitor that owns them, but also a journey of discovery for myself. The period from 1930-1944 was a time of great difficulty for the people living in the Ukrainian SSR (Soviet Socialist Republic). The Ukrainian Famine (Holodomor) of 1932-1933, which some historians say was intentionally engineered by the national government in retribution for the Ukrainian independence activities, was devastating. The actual numbers are unknown, but it is generally agreed that millions of Ukrainian citizens died of starvation during this period. Then, by the end of the 1930's, Nazi Germany had begun its invasion of Eastern Europe, and ultimately, the USSR itself. Their end-goal was the replacement of the indigenous ethnic populations with German settlers, creating an Aryan state stretching from Germany to the Ural Mountains. The brutal Nazi German occupation of the Ukrainian SSR would last from June 1941 to October 1944. For a larger version of the images below, please click on the image. Antonina's husband, Svitozar Drahomanov, was the son of Mykhailo Petrovych Drahomanov (1841-1895), the famous Ukrainian political theorist, economist, historian, and philosopher. The policy, shown above at the left, expresses the insurance policy amount and the premiums in Cyrillic script, which I can not read. A Ukrainian friend of mine assisted in the translation. Annual Premiums: 60 Rubles (quarterly payments of 15 Rubles). The page shown above, at the right, reflects the policy period from November 1938 through November 1939. Each payment box has a 6 Ruble and a 9 Ruble State Insurance stamp affixed to it, reflecting each of the 15 Ruble quarterly payments. The page shown above, at the left, reflects the policy period from November 1939 through November 1940. On this receipt page, the State Insurance stamps are haphazardly glued on top of each other. The page shown above, at the right, reflects the policy period from November 1940 through November 1941. These quarterly payments are indicated by 15 Ruble denomination State Insurance stamps. 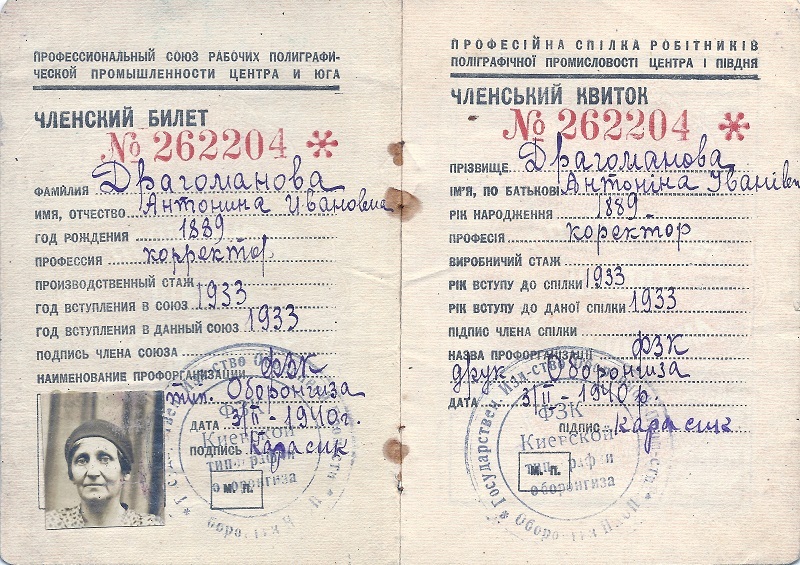 The last payment was made on August 11, 1941. 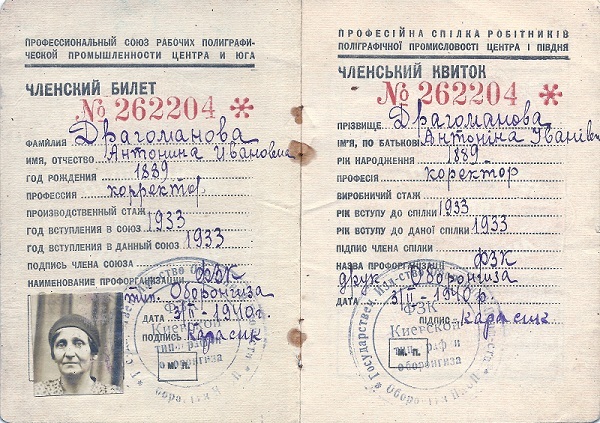 There were no further policy payments, as shortly after this time, the Ukraine had become a Nazi German Protectorate. Svitozar and Antonina Drahomanov fled the Ukrainian SSR and immigrated to the United States, where their descendants now reside.